I sat down and tried to think of who my inspiration is, but there was a problem. The problem was not that I didn’t have one; it was that there were too many! Way too many. I have been fortunate enough to have so many strong, influential, especially female, idols in my short life so far, and each one of them will have an impact on me forever. My mom, of course is the first to come to mind. This woman started from a relatively poor background, went to nursing school, and has landed herself a dream job that very few women in today’s time will every reach. She is able to more than provide for me and my siblings and has established a reputation for herself locally, and really nationally as an exceptional leader. I am so proud of her and admire everything she does and all that she is: a strong leader, caring mom, follower of God, and beautiful person. She has inspired me to shoot for the stars and believe that I can do anything. My Occupational Therapy Mentor. God brought me the most incredible mentor whom I have learned so much about kids and the profession, but also about friendship and the kind of person I want to be; someone who is thoughtful and supportive. She inspires me to continue learning and growing in my knowledge of therapy. My Boss. Does this surprise you? Since I was 15 I have worked at the same place. At my work I’ve been given incredible opportunities and experiences which have taught me more than I could have ever learned in a classroom. I’ve developed in my leadership, communication, and interpersonal skills as a result of this organization and I owe it all to the founder and executive director, my boss. She inspires me to one day create my own non-profit: to take my visions and make them a reality. Not many people can say they have as close of a relationship as I have with their boss, and sometimes it’s probably too close. But as mom first, and boss second, I am blessed to have this lifelong friend. My Physical Therapist. She started her own practice around the age of 30 and has been incredibly successful. I’ve been able to work with her for 6 years and can always count on compassion and understanding, which is not always found in therapists, unfortunately. I am inspired by her business skills and insight into patients. My Sister. I’ve always looked up to my sister since I was little, as most younger siblings do. She earned a degree in a profession she loves and feels strongly about and absolutely excels in her place of work. I admire her connection with children and ability to comfort them, distract from fear, and educate. She was even chosen to co-chair the national conference this year for her field! I’m so proud of you, Amanda! You inspire me to love what I do each and every day. My Grandma. Although our time was cut short, I will never forget the many things I learned from this smart lady. She taught me to slow down, appreciate each day for what it has to offer, enjoy the experience, and be kind to everyone you meet. Be. Here. Now. Now that I’m done bragging about all the amazing people that have impacted me and my life, share yours below! 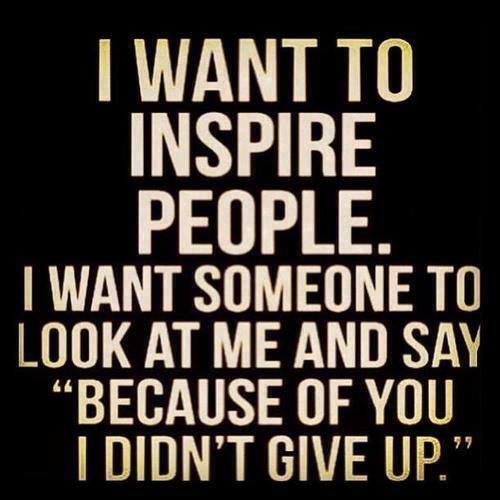 Who do you feel has inspired you?